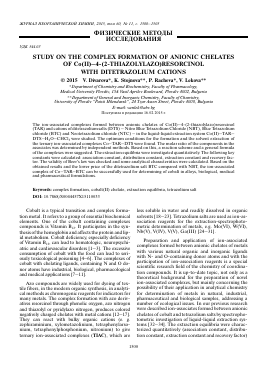 STUDY ON THE COMPLEX FORMATION OF ANIONIC CHELATES OF CO(II)–4-(2-THIAZOLYLAZO)RESORCINOL WITH DITETRAZOLIUM CATIONS - тема научной статьи по химии из журнала "Журнал неорганической химии"
E-mail: vanlek@abv.bg Поступила в редакцию 16.02.2015 г. The ion-associated complexes formed between anionic chelates of Co(II)—4-(2-thiazolylazo)resorcinol (TAR) and cations of ditetrazolium salts (DTS) — Nitro Blue Tetrazolium Chloride (NBT), Blue Tetrazolium chloride (BTC) and Neotetrazolium chloride (NTC) — in the liquid-liquid extraction system Co(II)—TAR— DTS—H2O—CHCl3 were studied. The optimum conditions for the formation and the solvent extraction of the ternary ion-associated complexes Co—TAR—DTS were found. The molar ratio of the components in the associates was determined by independent methods. Based on this, a reaction scheme and a general formula of the complexes were suggested. The extraction equilibria were investigated quantitatively. The following key constants were calculated: association constant, distribution constant, extraction constant and recovery factor. The validity of Beer's law was checked and some analytical characteristics were calculated. Based on the obtained results and the lower price of the ditetrazolium salt BTC compared with NBT, the ion-associated complex of Co—TAR—BTC can be successfully used for determining of cobalt in alloys, biological, medical and pharmaceutical formulations. Cobalt is a typical transition and complex formation metal. It refers to a group of essential biochemical elements. One of the cobalt containing complexes compounds is Vitamin B12. It participates in the synthesis of the hemoglobin and affects the protein and lipid metabolism. Cobalt deficiency, especially deficiency of Vitamin B12, can lead to hematologic, neuropsychiatry and cardiovascular disorders [1—3]. The excessive consumption of cobalt with the food can lead to seriously toxicological poisoning [4—6]. The complexes of cobalt with chelating ligands, containing N and O donor atoms have industrial, biological, pharmacological and medical applications [7—11]. less soluble in water and readily dissolved in organic solvents [18—23]. Tetrazolium salts are used as ion-association reagents for the extraction-spectrophoto-metric determination of metals, e.g. Mo(VI), W(VI), Nb(V), V(IV), V(V), Ga(III) [24-31]. and the analytical characteristics (molar absorptivity, Sandell's sensitivity, adherence to Beer's Law, limit of detection, limit of quantification) were calculated. The present work is a part of thorough and comprehensive study on the ion-associated complexes of cobalt containing tetrazolium salts. The aim ofresearch is to study the complex formation of ternary ion-association complexes formed between anionic chelates of Co(II)-4-(2-thiazolylazo)resorcinol (TAR) and cations of ditetrazolium salts (DTS) — Nitro Blue Tetrazolium Chloride (NBT), Blue Tetrazolium chloride (BTC) and Neotetrazolium chloride (NTC). The purpose is application of the extraction systems for determining of cobalt in alloys, biological, medical and pharmaceutical formulations. CoSO4 ■ 7H2O (Sigma-Aldrich Chemie GmbH, p. a. ), 1.7 x 10-2 mol dm-3 aqueous solution. Working solution (CCo(II) = 1.7 x 10-4 mol dm-3) was prepared by dilution. 4-(2-Thiazolylazo)resorcinol (TAR) (96%, Sigma-Aldrich Chemie GmbH) dissolved in slightly alkalized distilled water, CTAR = 2.0 x 10-3 mol dm-3. 3,3' -(3,3' - dimethoxy-4,4' -biphenylene)bis[2-(4-nitrophenyl)-5-phenyl-2H-tetrazolium chloride (Nitro Blue Tetrazolium Chloride, NBT) (Merck KGaA, p. a. ), CNBT = 2.0 x 10-3 mol dm-3. 3,3' -(3,3' - dimethoxy-4,4' -biphenylene)bis(2,5-diphenyl-2H-tetrazolium chloride) (Blue Tetrazolium Chloride, BTC) (Sigma-Aldrich Chemie GmbH, p.a. ), CBTC = 2.0 x 10-3 mol dm-3. 3,3'-(4,4'-biphenylene)bis(2,5-diphenyl-2H-tet-razolium chloride) (Neotetrazolium Chloride, NTC) (Sigma-Aldrich Chemie GmbH, p .a. ), CNTC = 2.0 x x 10-3 mol dm-3. The acidity of the aqueous medium was set using the buffer solution prepared by mixing 2.0 mol dm-3 aqueous solutions of CH3COOH and NH4OH. Organic solvent - CHCl3 (additionally distilled). The pH was checked by HI 83140 pH meter (Romania). A Camspes M 508 spectrophotometer (United Kingdom), equipped with 10 mm path length cells, was employed for reading the absorbance. chloroform was added and the funnels were shaken. A portion of the organic extract was filtered through a filter paper into a cell and the absorbance was read against a blank. The distribution constant KD was found by Eq. (1), where A1 is the light absorbance for the extracted specie obtained after a single extraction at the optimum conditions and A3 is the absorbance for the organic extract obtained after a triple extraction under the same conditions. The single extraction and the first stage of the triple extraction were performed with 10 mL chloroform. The organic layers were transferred into 25 cm3 calibrated flasks and the flask for the single extraction was brought to volume with chloroform. The second stage of the triple extraction was performed by adding a 7 cm3 of chloroform to the aqueous phase that remained after the first stage. The third stage was performed in the same way. The two successive organic layers were transferred to the flask containing the organic layer obtained after the first stage. The volume was brought to the mark with chloroform and shaken for homogenization. Ab-sorbencies A1 and A3 were measured against a blank. The absorption spectrum of the extract of the ternary ion-associated complexes Co-TAR-DTS in CHCl3 is characterized by an absorption maximum in the visible range (^max = 520 nm) (Fig. 1). The acidity of the aqueous phase has a substantial effect on the extraction of the ion-associated complexes into the organic phase. The maximum and constant extraction of the ternary ion-association complexes Co-TAR-DTS is achieved in the pH range 5.00-6.00 (DTS = NBT), 5.00-5.75 (DTS = BTC) and 4.75-6.00 (DTS = NTC), respectively (Fig. 2). The carried out experiments, showed that the extraction equilibrium was achieved in less than 60 s. The longer shaking time does not affect the absorbance in both cases. The further experiments were performed for 2 min. Fig. 1. Absorption spectra of the TIAC Co(II)-TAR-DTS in CHCl3 against blanks CCo(II) = 1.7 x 10-5 mol dm-3. A CTAR = 2.0 x 10-4 mol dm-3, CNBT = 2.0 x x 10-4 mol dm-3; ♦ CTAR = 1.4 x x 10-4 mol dm-3, CBTC = 1.0 x 10-4 mol dm-3; • CTAR = 2.0 x 10-4 mol dm-3; CNTC = 2.0 x 10-4 mol dm-3. BTC (>0.5 x 10-4 mol dm-3) and 7.1-fold excess of NTC (>1.4 x 10-4 mol dm-3). Fig. 2. Absorbance of Co—TAR—DTS extracts against TAR—DTS extracts vs. pH of the aqueous phase plots: cCo(H) = 1.7 x 10-5 mol dm-3; CTAR = 2.0 x 10-4 mol dm-3; CDTS = 2.0 x 10-4 mol dm-3. KOSTOVA D., MEHANDJIEV D. — 2013 г.
KOSTOVA D. — 2014 г.
DIMITROV A.N., GAVAZOV K.B., LEKOVA V.D., RACHEVA P.V. — 2010 г.
BOYANOV B.S., DIMITROV A.N., GAVAZOV K.B., LEKOVA V.D. — 2007 г.